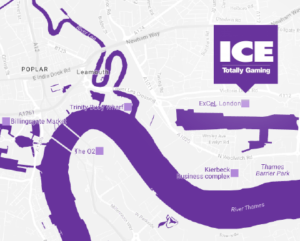 Are you attending ICE Totally Gaming in London this February? This is the place to build potential partnerships that will result in valuable business opportunities if you are in the gaming industry. You want to make the most out of the roadshow because this is the best opportunity to connect with like minded people? 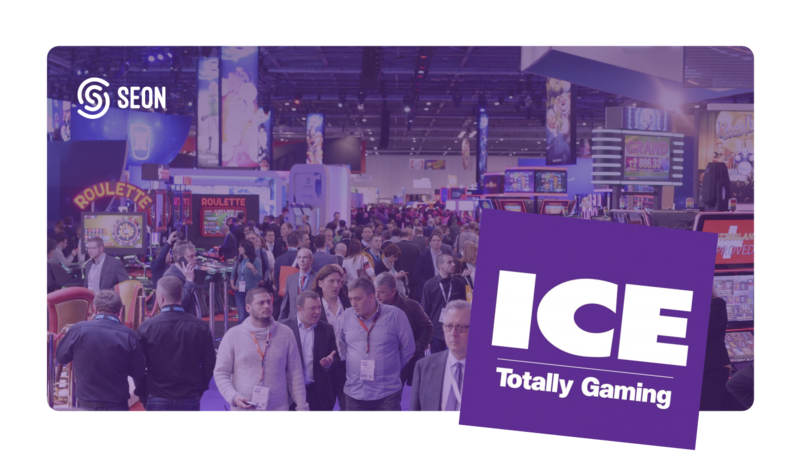 You’ve heard that ICE Totally Gaming is hard to navigate because it is the largest B2B event in the world? If so, we’ve got the answers for you! In this post, we’ve collected all you need to know about ICE 2018 in order for it to be a rewarding attendance. Before you start, make sure to register as an attendee and to download the floorplan of the exhibition space. The show attracts international players from both the online and offline gaming sectors. ICE is a hub for operators, regulators, service providers and mainly anyone involved in the industry. Numerous businesses use the opportunity to announce innovative ideas, launch new products and to build promising partnerships. The noise is enormous and the crowd is immense. Based on our past experience with the event, here are some of the most important things to keep in mind for an effective attendance. First of all, let’s keep in mind the size of ICE Totally Gaming. The ExCeL convention center is located on 100-acre site. Walking from one end of the building to the other takes about 10 minutes. There are two entrances to the event. The West lobby is the main entrance of the venue, meanwhile the show can also be accessed via the East doorway. Once registered, be sure to keep the badges on at all times as they are scanned at multiple checkpoints inside ICE. Due to the large scale attendance, the main foyer can get crowded during lunch hours. Make sure to pick up an early lunch if you want to dine at a table while seated. 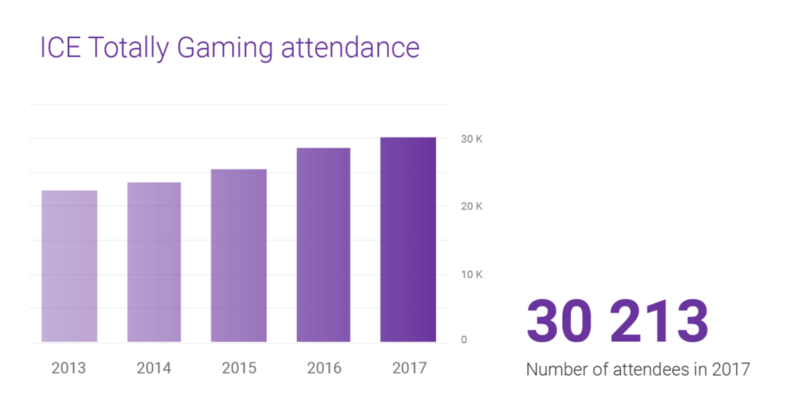 The number of attendees has been steadily growing over the years! Most of the exhibitors are segmented based on location. There are various industries exhibiting at the event. Whether this is intentional or not, these different industries are segmented based on location to some extent. The major payment service providers can be found towards the end of the north hall of the venue. Offline casino and gambling related businesses are mostly spread centrally in the both of the halls. Turnkey solution providers can be found near the West wing of the South hall. Some are also spread towards the central entrance of the North hall. Make sure to go through the list of exhibitors and select the relevant ones! Once again, the venue is huge. There are over 30,000 attendees during the span of three days. In order to effectively be able to navigate the conference and to maximize the created value, it is best to arrive with a solid plan in mind. The most effective approach is to preselect a list of businesses and booths to visit and get in touch. It is crucial for these to be potential partnerships that may result in valuable business opportunities. Your survival guide for this years event! Print out the floorplan and circle all of the interesting businesses! The venue map can be downloaded (PDF) and printed from the event floorplan page. This is especially essential for first time visitors. In any case, often times it is tricky to find a relevant stage or booth. Utilizing a map to navigate around the venue can save a lot of time and potential headaches. Next, it is best to circle all of the relevant businesses (that were previously gathered) and their locations on the map. Make sure to keep track of your contacts! Lastly, make sure to take a couple of quick notes after getting in touch with the members of a company. Plenty of business cards and flyers will be collected. It is most likely that the event is an opportunity to meet people that were unanticipated during the planning phase. In order to ensure the effective follow-up process after the show is over, be sure to take a set of notes after each meeting. This is most effective in a spreadsheet via a smartphone. ICE Totally Gaming is the largest meeting hub for the gaming industry. In order to maximize the effectiveness of attending the show, there a various goals and objectives to be established. If the relevant steps are kept in mind during the planning phase, the event may hold massive opportunities with regards to business development. Have you thought about adapting fraud prevention module for your business in order to make your life easier? At SEON, we help high risk merchants accurately prevent fraud with our integrated machine learning fraud prevention API. We would love to meet with you during ICE 2018. Click here to schedule a time-slot to meet us at our booth (N9-540) during the event.